Kellogg Canada is introducing six new cereal and snack products addressing what it calls “emerging” consumer needs and preferences, specifically for real flavours and ingredients. Four of the additions come in the company’s Special K product line, courtesy of a new product called Nourish. The additions come as Kellogg looks to shed the 60-year-old brand’s reputation as a diet product. They include two new cereals, Special K Nourish Raspberry & Almond and Special K Nourish Coconut Cranberry & Almond (which are being sold in 396-gram boxes with a suggested retail price of $5.99), and two cereal bars, Special K Nourish Dark Chocolate Chunks & Almond and Special K Nourish Cranberry & Almond (which are being sold in boxes of five 33-gram bars with a suggested retail price of $3.99). This new positioning is being supported by changes to Special K itself, specifically the addition of more red berries, he said. “We’re definitely seeing people respond to that program, not just here in the U.S., but also in Canada, and we’re seeing the brand do better,” Bryant told analysts, noting that Special K sales increased in the second and third quarter of 2015 after several quarters of decline. The new Nourish products, said Bryant, boast “positive nutrition and ingredients the consumer can see in the food.” The inclusion of “on-trend” grains such as quinoa is helping boost the cereal’s popularity, he said. 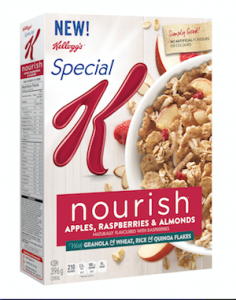 Chris Bell, vice-president of marketing for Kellogg Canada in Mississauga, Ont., said the new additions to the Special K brand were the result of research into what female consumers want, and responding with breakfast and snacking options that feature real, visible ingredients and positive nutrition. Kellogg is also adding to its Mini-Wheats cereal portfolio with a new product called Harvest Blueberry & Red Wheat, which comes in a 405-gram box with a suggested retail price of $5.99. Bell said the new Mini-Wheats product was designed to address millennial adults’ desire for foods capable of delivering a balance of nutrition and taste from simple ingredients. 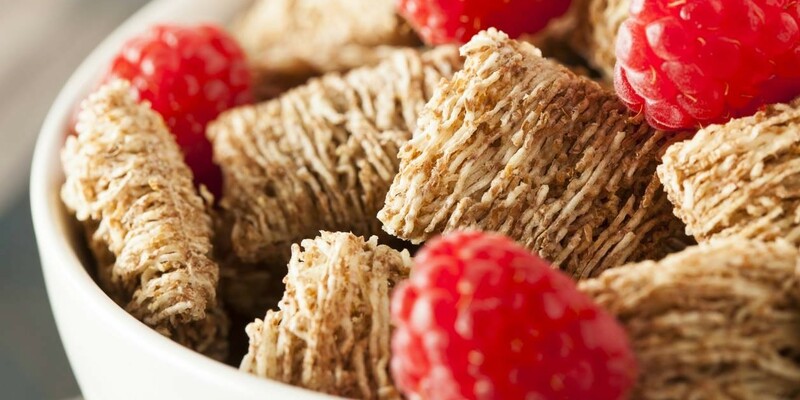 Mini-Wheats features no artificial flavours or colours, and includes real ingredients including harvest blueberries, eight layers of whole-grain red wheat and a hint of sweetness. The other new addition comes in the Pringles portfolio. The Pringles Salsa Fiesta Flavour combines the taste of tortillas and salsa in a single chip and is being sold in a 182-gram package with a suggested price of $2.69. All of the products will be supported by marketing campaigns spanning multiple consumer touch-points including TV, print, digital, PR, online video and display, in-store, shopping activations and couponing, said Bell.